An ultrasound uses sound waves to create images of the inside of the body. 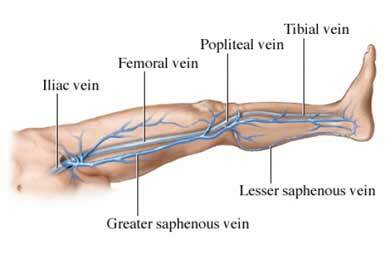 A venous duplex ultrasound is an ultrasound that looks at the flow of blood through the veins in the arms or legs. You will be asked to lie on a table. Gel will be placed on the skin of your arm or leg, over the veins being tested. The ultrasound machine has a hand-held instrument called a transducer, which looks like a microphone or wand. The transducer is pushed against your skin where the gel was applied. The transducer sends sound waves into your body. The waves bounce off structures in the body and echo back to the transducer. The echoes are converted to images that are shown on a screen. The doctor examines the images on the screen. He may make a photograph of them as well. The technologist may push the probe firmly or softly against your skin in order to better see the vein and to see if it collapses under pressure. You can get dressed and go home. The length of the test varies, depending on your situation. In most cases, it will take between 15-45 minutes. In general, this test is not painful. You may feel some mild discomfort as pressure is applied to your arm or leg. A radiologist, cardiologist, or vascular surgeon will read the images. The test results will be sent to your doctor. Your doctor will notify you of the results and provide you with recommendations. Deep vein thrombosis (DVT). EBSCO DynaMed Plus website. Available at: http://www.dynamed.com/topics/dmp~AN~T133588/Deep-vein-thrombosis-DVT. Updated November 5, 2017. Accessed March 2, 2018. Matić PA, Vlajinac HD, Marinković JM, Maksimović MŽ, Radak DJ. Chronic venous disease: correlation between ultrasound findings and the clinical, etiologic, anatomic and pathophysiologic classification. Phlebology. 2014;29(8):522-527. Ultrasound—venous (extremities). Radiology Info—Radiological Society of North America website. Available at: https://www.radiologyinfo.org/en/info.cfm?PG=venousus. Updated April 1, 2017. Accessed March 2, 2018.